Brooklyn SolarWorks wants to help bring solar power to New Yorkers. Stunning new renderings of the company’s Solar Canopy envision how city dwellers might benefit from this innovative product. The Solar Canopy offers solar in spots where traditional solar panels can’t go because of fire codes or obstacles. Beyond just generating clean energy, the canopy could create new living spaces and redefine urban solar. Brooklyn SolarWorks’ Solar Canopy, designed with SITU Studio, has been around for a while, popping up around New York City in Park Slope, Crown Heights and Bed-Stuy to name a few. The new renderings paint a picture of what urban solar power could look like; for example, a relaxing rooftop dining area. The Brooklyn SolarWorks website says the company is “capable of putting solar panels on almost anything. Whether you have ample roof space free of obstacles or your roof is littered with vent pipes, skylights, and hatches, we will likely be able to figure out a solar solution.” The Solar Canopy is one of those solutions. By raising solar panels nine feet above rooftops, the company can work around restrictive fire codes. 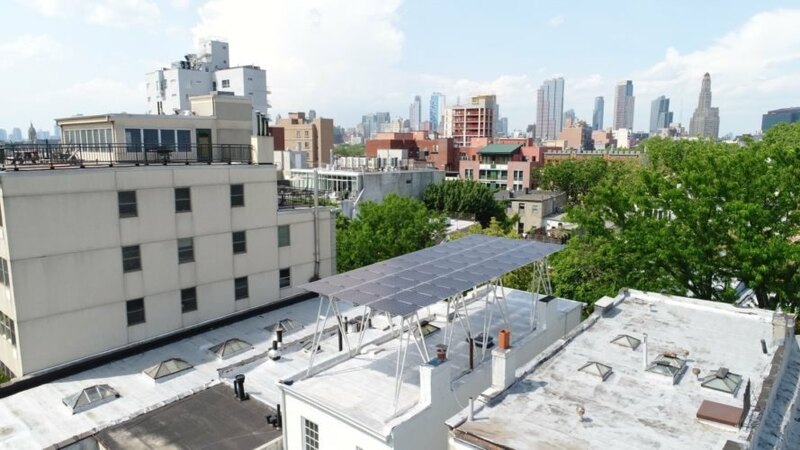 Brooklyn SolarWorks uses different panels depending on the job at hand; two of the most popular are Silfab’s SLA-M 310 Wp Monocrystalline panels that offer “100 percent maximum power density” and LG NeON 2 355W panels, which use thinner wires for a more aesthetically-pleasing appearance. 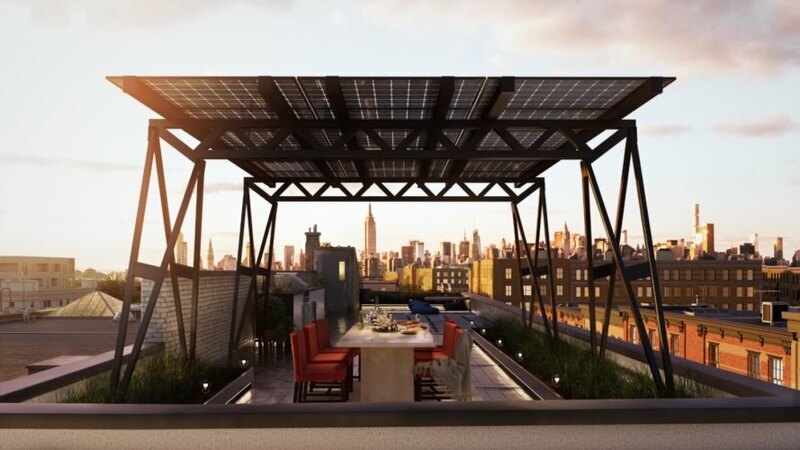 You don’t have to leave your couch to check out the Solar Canopy; Brooklyn SolarWorks offers an immersive 3D model that you can explore with virtual reality goggles. Find out more about the company and its innovative products on the Brooklyn SolarWorks website. Brooklyn SolarWorks recently released renderings of its Solar Canopy. The Brooklyn SolarWorks renderings envision how the Solar Canopy might enhance city space. Brooklyn SolarWorks' Solar Canopies have already popped up around New York City. 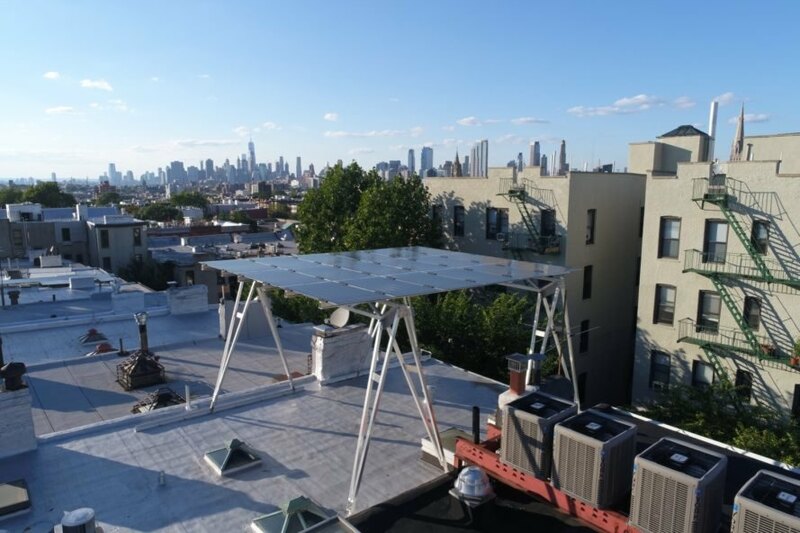 The Solar Canopy allows Brooklyn SolarWorks to get around restrictive fire codes. The Solar Canopy raises solar panels nine feet above a rooftop.